All classes will be held at the Holiday Inn-Chantilly Dulles Expo, located across the parking lot from the show. Forgot something for your class? No problem. A few steps away will provide everything you need for your workshop. Please email questions regarding classes or supply lists to qushowclasses@quiltersunlimited.org. Refer to the instructor’s website for more information on their work. Please use the links provided to access class info. 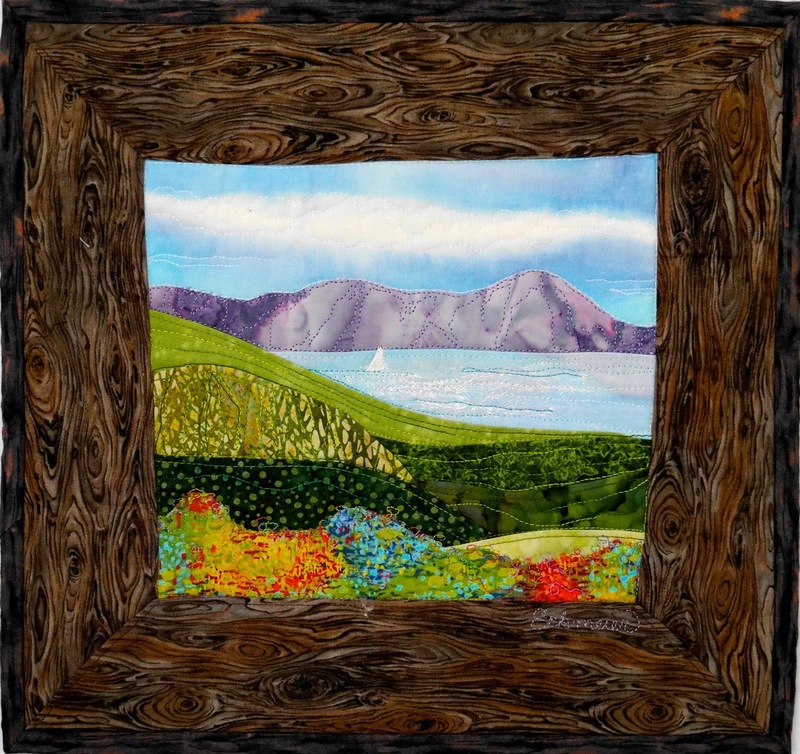 Explore the freedom of fabric collage! No seams to piece or match, no lines to trace….just free form cutting of step and window shapes. Step-by-step your little village will magically come to life. A layer of tulle and machine stitching will complete your fabric collage project. 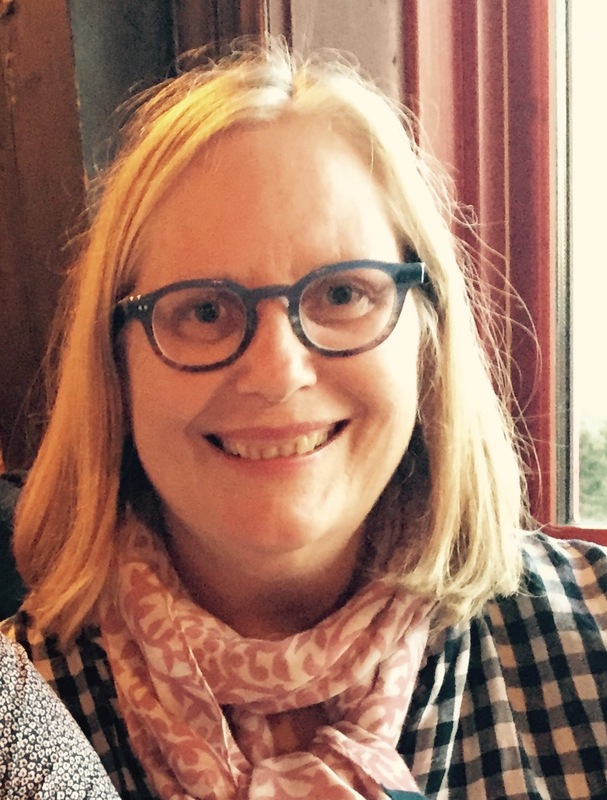 For Margaret, it’s the fabric that comes first; prints and colors have inspired her since childhood. She works very impulsively and very rarely plans the entire quilt before starting. She likes her quilts to look old so designing and making quilts which look like they come from yesteryear has become her passion. 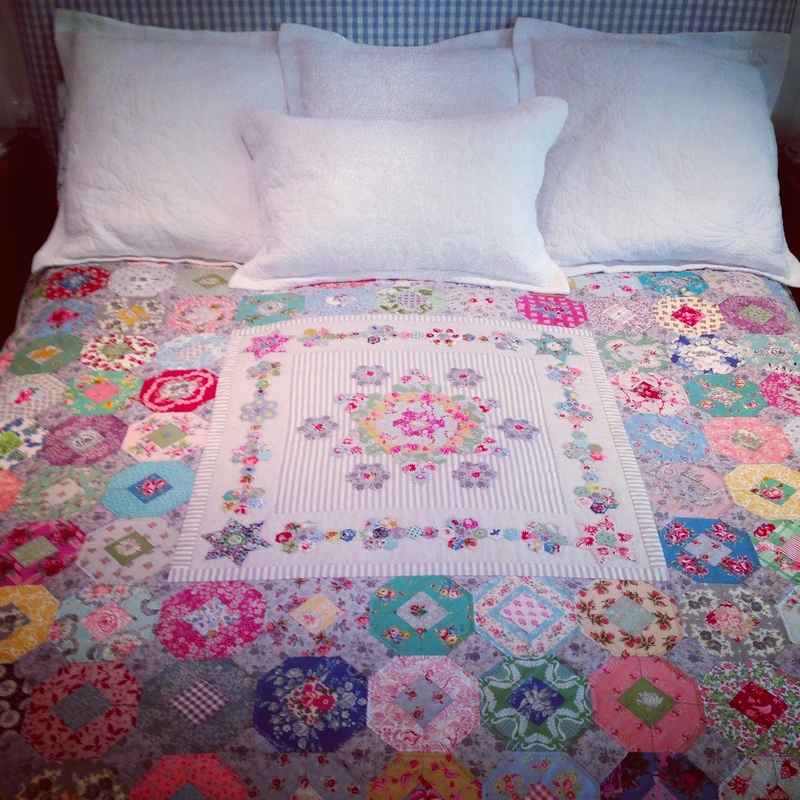 Her quilts range from original designs to those, which are reproductions of antique quilts. You can see some of Margaret’s newest designs in her first book ‘Quilts from the Colonies’ published in 2017 by Quiltmania. Come and join Margaret for a relaxing day of Traditional Hand Applique. As you stitch, you’ll also learn Margaret’s hints for making authentic reproduction quilts just like hers… full of the charm of times gone by. 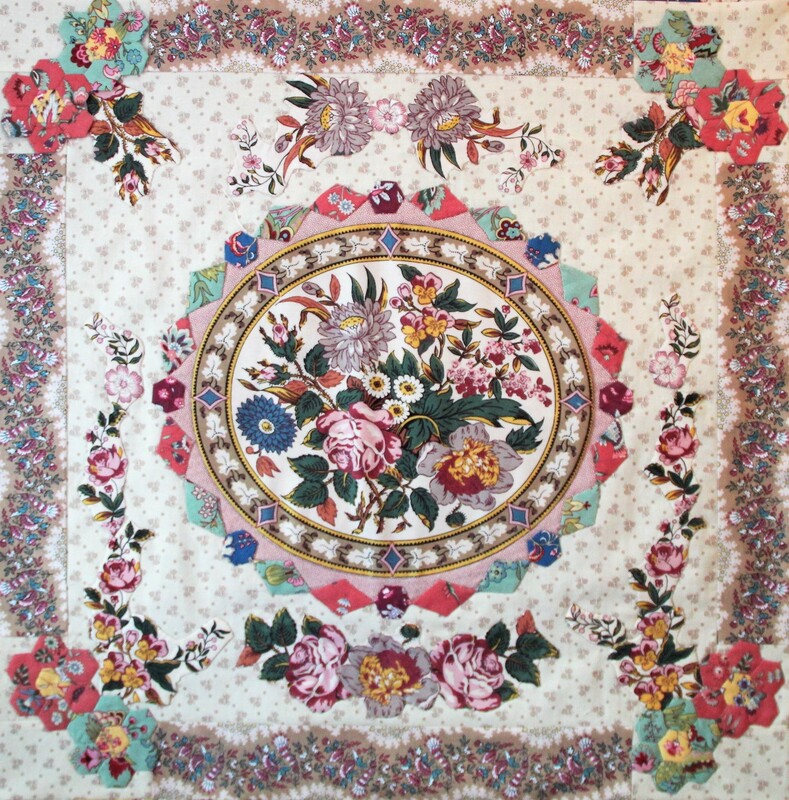 You will have the choice of two quilts to begin on the day while learning Needle-Turn Appliqué techniques. 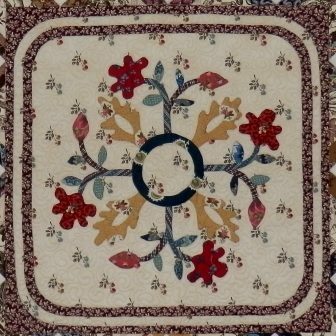 You will make the center applique block of a choice of one of two reproduction quilts. PLEASE SELECT ONE. Kit for the selected quilt will be provided and is included in the class price. 1. Rosa Biddlecombe, a charming English style medallion named after Margaret’s Great Grandmother. 2. 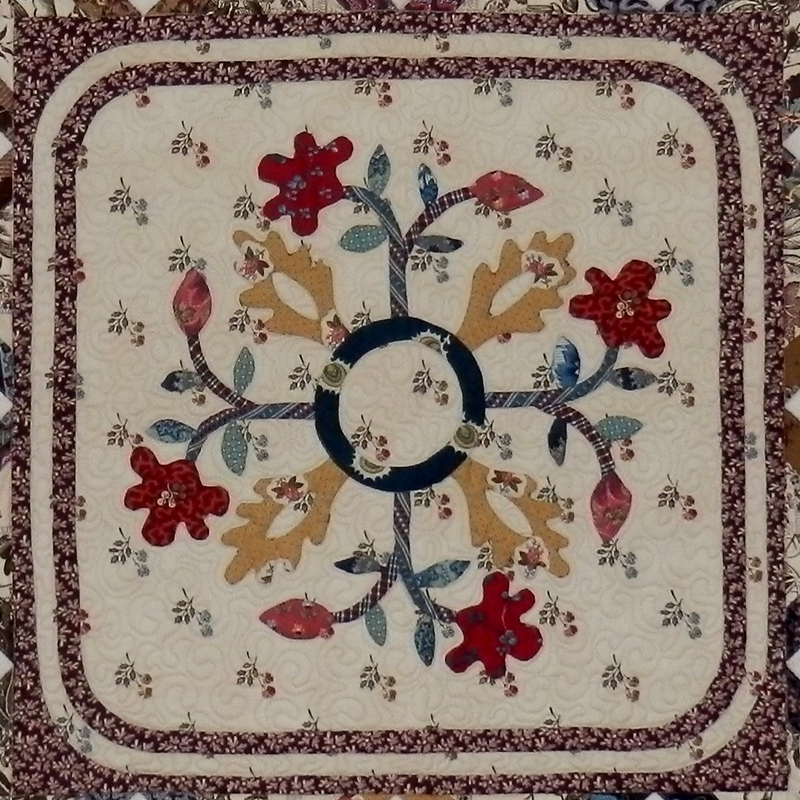 Indiana Medallion, a beautiful, traditional wreath design is at the center of pieced quilt. Hand piecing is where Margaret’s quilt making journey began and it is still her preferred method of piecing. It’s the simple requirements and quiet contemplation as the block comes to life that appeals. Join Margaret in this one-day class and be inspired to tackle a challenging block, or one a little simpler… the choice is yours. PLEASE SELECT ONLY ONE. Templates for the selected quilt will be provided and are included in the class price. 1. Indiana Medallion, Scrappy 6” Rolling Star blocks abound in this medallion quilt. 2. 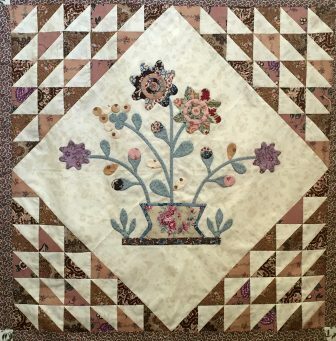 Rosa Biddlecombe, fun and simple blocks to surround an English Medallion quilt. As far back as Judy can remember, fabric and pattern have been her interest and love. In the years after her children were born, she started working in a patchwork shop, which firmly cemented her love of patchwork and quilting to the exclusion of all other crafts. 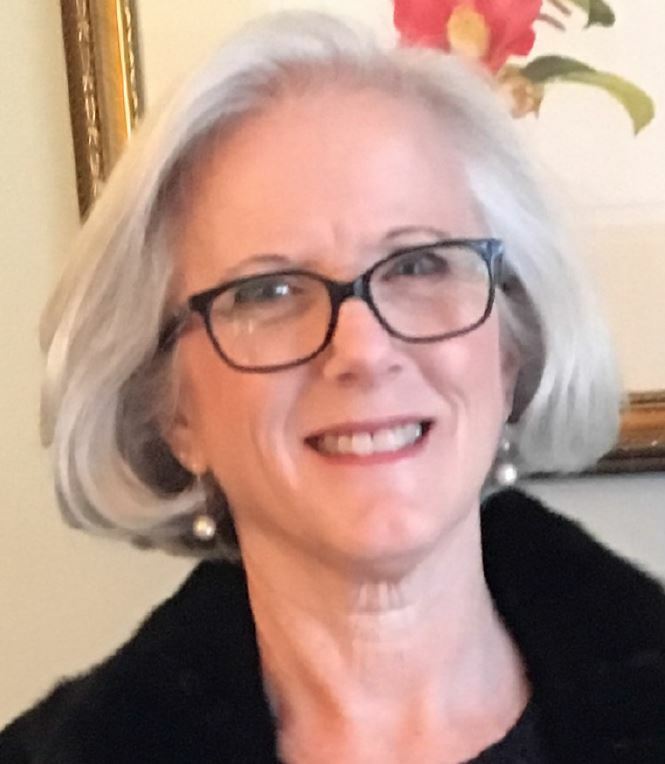 Her first book with Quiltmania Editions, ‘Quilts for Life, Made with Love’, was published in 2017. This has brought Judy all sorts of rewards, teaching all around Australia and overseas and meeting like-minded women from all walks of life. 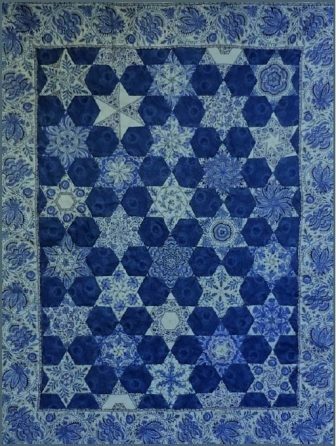 Students will use hand applique, templates, and perhaps English paper piecing to make one of these beautiful quilts. Techniques taught in the class will cover both quilts. Kits: Starter kits will comprise enough fabric to begin and make a number of the blocks associated with either quilt. 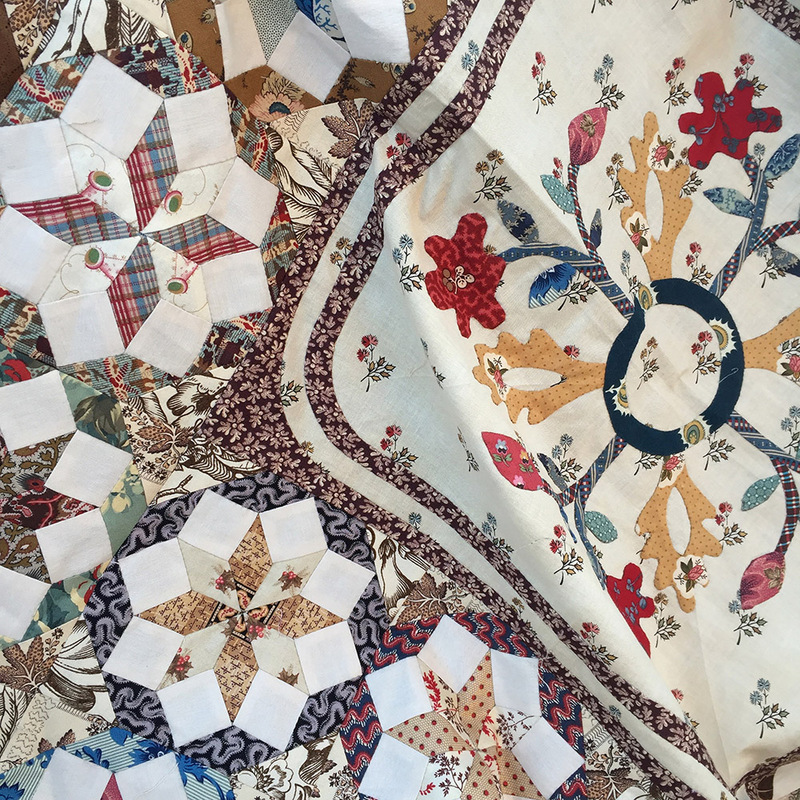 Kit & templates for the selected quilt will be provided and are included in the class price. Techniques Covered in Class: Tracing templates with curved seams, hand piecing curved seams, applique, and how to assemble the block. There will also be a discussion on the needles and thread Judy uses and color combinations. 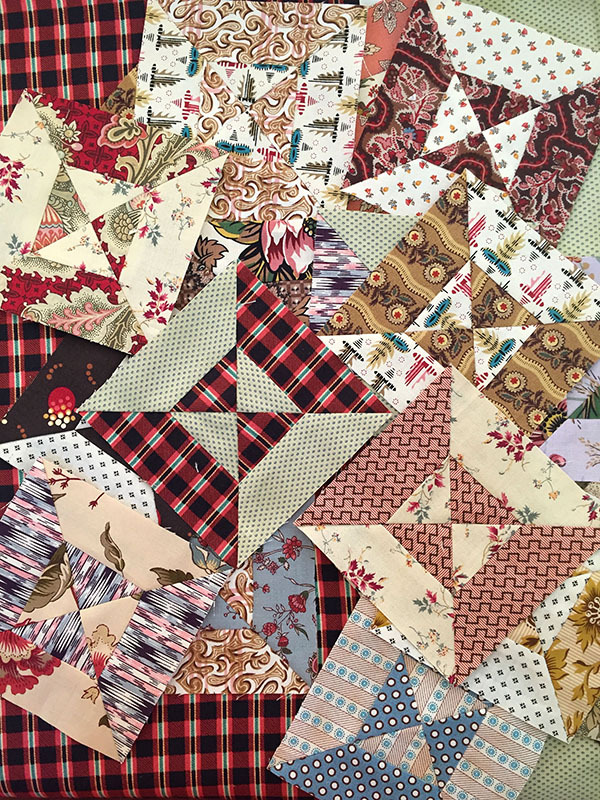 The County Claire kit will include many green fabrics as appear in Judy’s quilt including reds, blues and black and grey background fabrics, in order to give your quilt a similar look (up to 2 yards in total). Extra fabric to complete the blocks in a similar color palette, 1½ yards of border fabric, backing, binding etc. will be required. 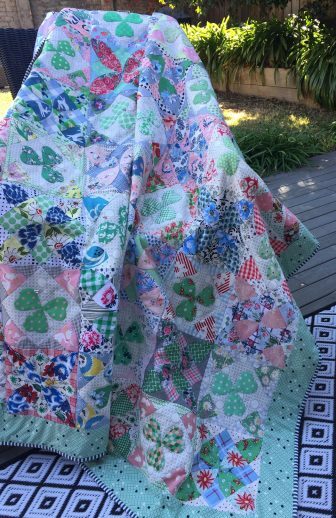 Note: Judy’s background fabric for Shamrock, County Claire is optional and can be purchased from the instructor in class. Please send an email to qushowclasses@quiltersunlimited.org if you wish to purchase. Techniques Covered in Class: Hand piecing, curved seam piecing, needle turn applique, and English paper piecing. Also, information on color and fabric design combinations. Emma Mary Kit: There will be a soft stripe fabric for the center background and second border together with a bundle of fabrics in a similar palette to Judy’s consisting of all colors, florals and spots in a bright vintage style consistent with the colors of the quilt. (approximately 3 yards in total). Hexagon papers and diamonds will also be included in the kit. For the Emma Mary quilt to be completed (i.e. fabrics not included in the quilt kit) you will need two yards of grey rose or other fabric, ¾ yard spot fabric for first border, and extra fabric to complete the blocks, backing, binding etc. 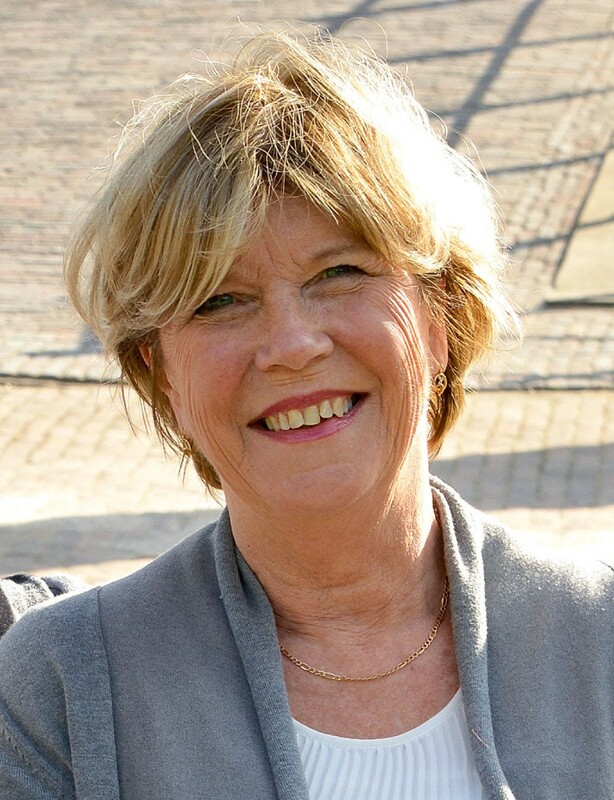 Petra Prins has written several bestselling books available through Quiltmania. She was chosen to be the Quiltmania Mystery Quilt Designer in 2016. 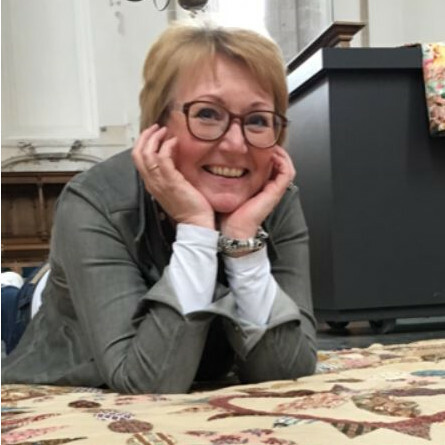 Petra owns a quilt shop in Zutphen, Netherlands and is co-owner of a fabric design company called ‘Dutch Heritage.’ Petra teaches classes on Accurate Hand Piecing. (Dutch quilters still predominantly hand piece their quilts.) 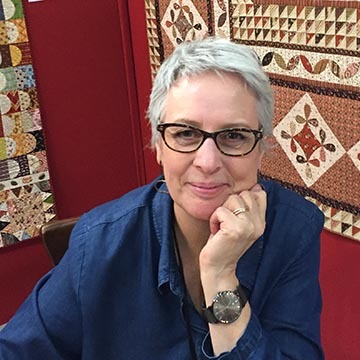 Her quilting partner, Judith Ebbelaar, will join her in teaching at the 2019 show. 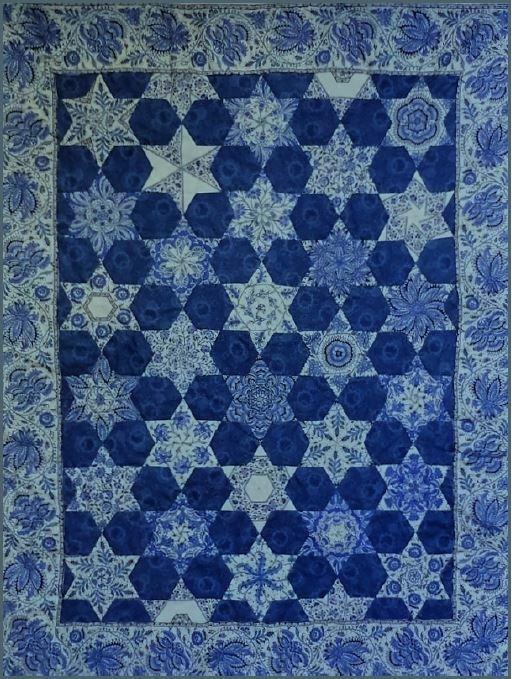 A lovely quilt made from the China Blue collection. The stars are all fussy cut. For the hexagons the dark blue two-tone is used. Class fee includes kit. 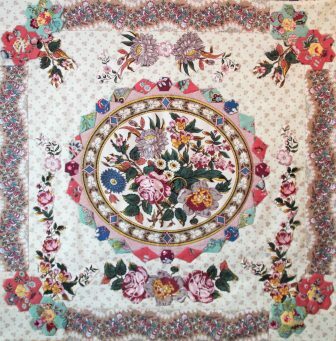 Kit (40” x 52 ½”) will include pattern, acrylic template, mirror, Wonderfil threads and fabric for quilt top. Backing fabric may be purchased for $36 directly from instructor in class. Send an email to qushowclasses@quiltersunlimited.org when enrolling if you wish to purchase backing. This lovely piece has an antique feel. Techniques used: Broderie Perse, English paper piecing, needle turn applique and fussy cutting. Kit will include: Fabrics, English paper piecing papers, glue stick, Roxanne Glue Baste It, and Wonderfil thread. Kit will be included when registering for the class. This lovely piece uses fabric reproductions of Dutch tiles and can be used to make a pillow. I have been quilting since high school but did not take my first class until after I was married. 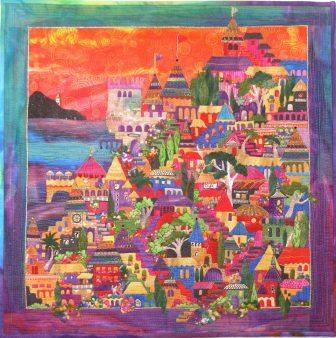 I have worked in several quilt shops, lectured and taught classes. 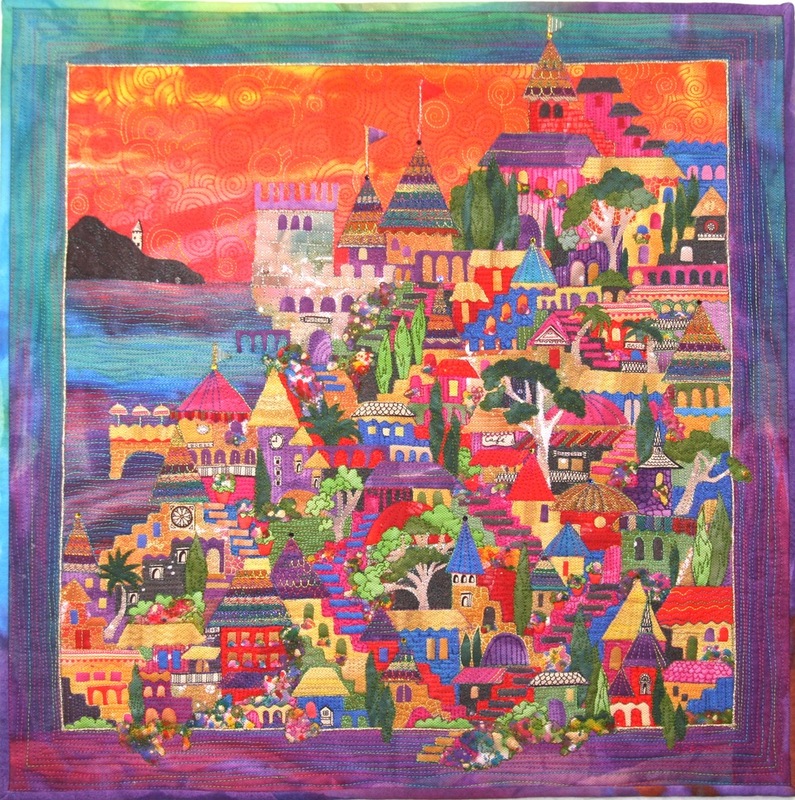 Although I use a variety of techniques, I focus on reproduction quilts, stitchery and wool appliqué. 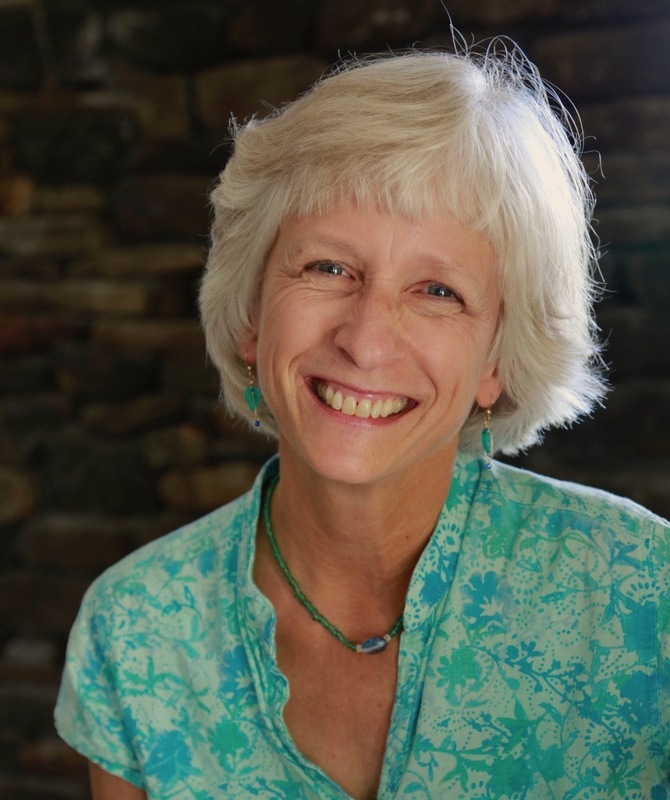 I enjoy going on retreats and taking classes as I feel there is always something new to learn. To me quilting is such a wonderful adventure because there is a wealth of variety in the techniques and styles used and because you meet the most wonderful people. Learn wool applique with an expert! 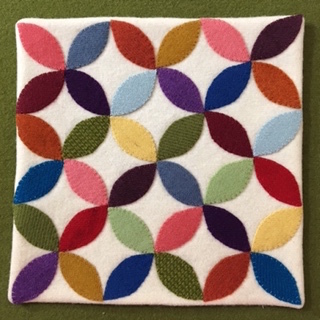 Teri will be teaching a wool appliqué project that is perfect for beginners but also fun for those who have done past projects. 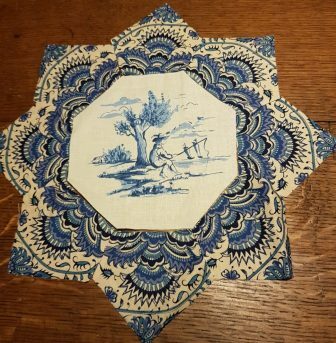 It is a project that can be made into a small pillow or tablemat. Kit included in class fee will provide everything needed to complete the project. Techniques: Participants will learn how to prepare the wool for appliqué, cut out the project, the necessary stitches and how to finish the project. Teri will talk about a variety of applications for wool appliqué. She will also have many samples to show you.